UPDATED: The term [fascia] means "band or bandage". It is derived from the Latin word [fascis] meaning "bundle", therefore a fascia is the bandage that ties a bundle. A bundle of sticks tied around an ax was the symbol of the lictors, the Roman imperial bodyguards. Many fasciae (Pl.) are eponymic, such as Camper's Fascia, Scarpa's fascia, Colle's fascia, etc. In anatomy, the word [fascia] refers to a sheet of connective tissue. The term encompasses many types of fasciae (plural for fascia) which range from the thin deep or muscular fascia to the tendon-like thick fascia lata of the thigh. The image shows the anterior aspect of the thigh and its covering, the fascia lata. The opening shown in the fascia lata is the fossa ovalis of the thigh. Do not confuse with the fossa ovalis found in the interatrial wall of the heart. Click on the image for a larger depiction. In the extremities, some fasciae may contain more than one muscle, creating fascial compartments. 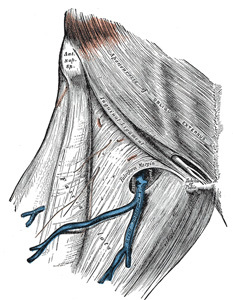 Trauma or vascular pathology in a fascial compartment may cause the muscles to swell to the point that the edema starts causing ischemia compromising the muscles to the point of necrosis. This is called "compartment syndrome" and may require a surgeon to cut open the fascia to relieve the pressure, a procedure called a "fasciotomy". For more information on [-otomy], click on this link.